The Tarahumara people live in the Copper Canyon region in the state of Chihuahua in northern Mexico. They are one of the poorest and most primitive of the native people in Mexico. They live by subsistence farming and sale of a few artifacts to tourists coming through the canyon. Crude wood and stone carvings, baskets made of pine needles and native grasses, and crude pottery are their main items. There are 50,000 members of the Tarahumara ethnic group in Chihuahua. Their language is Rarámuri. They live in communities with houses far from each other and away from the town center, which generally consists of a church and a school. Families reside on small plots of land, typically living in small, one-room log houses without running water or electricity. Fully 60 percent of the community is illiterate. The trader that we deal with has been going into this area for over 37 years and has tried to help the people by providing a market for their crafts. Recently he brought out a few Nativity scenes. Like the majority of the native people in Mexico, they have been converted to the Catholic religion, but they have never before made Nativity sets. This is one of the rarest Nativities you will see. The figures in this set are carved from pine. They are dressed in typical Tarahumara costumes. 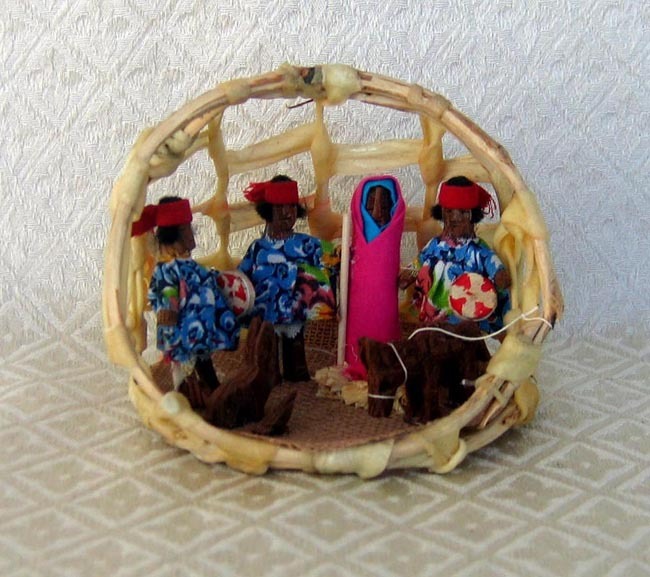 For the stable, they have been placed in a miniature Tarahumara burden basket made of wood and rawhide. There are 9 different figures in this set measuring 2.5 inches tall.